I love Asian fusion. 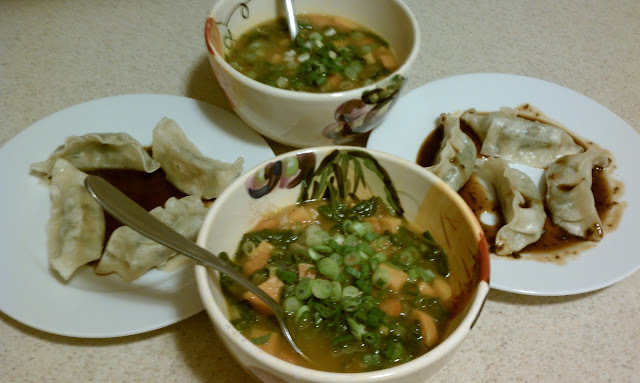 Thai, Tibetan, Vietnamese, and Japanese veggie soups are so delicious, but I have been intimidated by the exotic flavors in the kitchen. I've acquired tons of Asian ingredients over the last year or two and even bought a couple of cook books... but it still seems so foreign to me. Now That's One HEALTHY Pot of Soup! Coat the bottom of a large pot with a thin layer of olive or sesame oil. 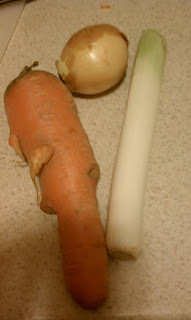 Add onion and leek. Saute for about 5 minutes over medium-high heat, stirring occasionally. 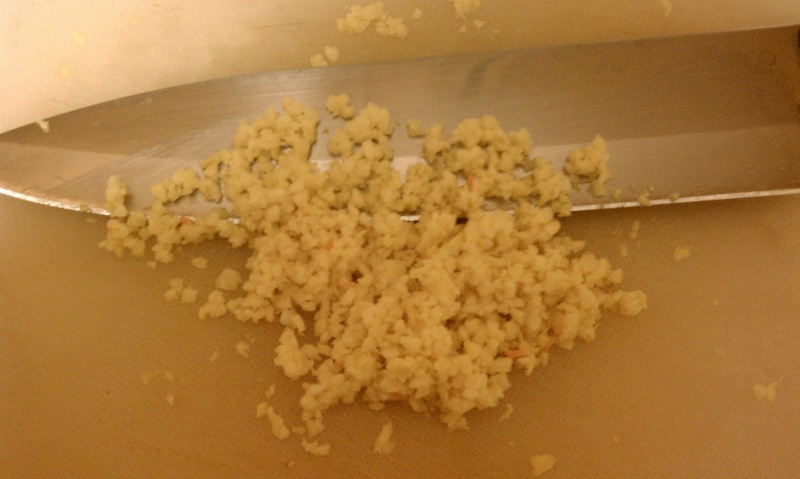 Add carrots, ginger, garlic, and a pinch of kosher salt. I Never Use a Whole Ginger Root at Once. Freeze Leftovers! Stir well to combine all flavors and saute another 5 minutes. 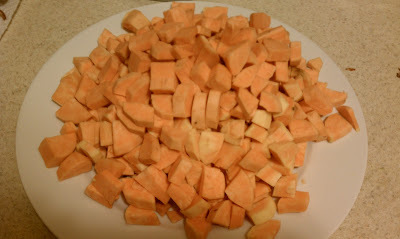 Add sweet potatoes, cover with broth, turn heat to high, cover, and bring to a boil. That Looks Like About a Pound to you, Right? minutes, until sweet potatoes are tender (go ahead and try a few!). 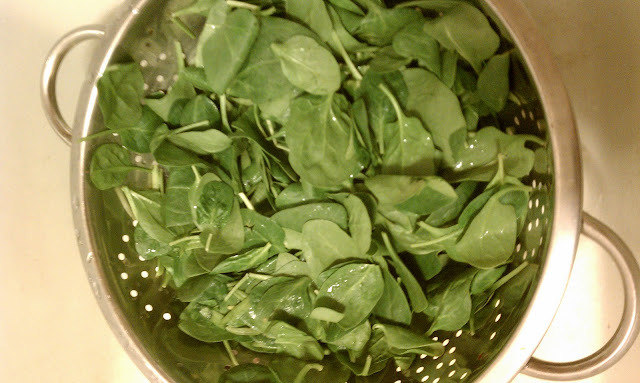 Once the potatoes are cooked to perfection, add spinach, turn off heat, and stir until well-combined and wilted. When's the Last Time You had Some Dark Leafy Greens?! Add a few dashes of the Ume Plum Vinegar and a few dashes of the Braggs Liquid Aminos. 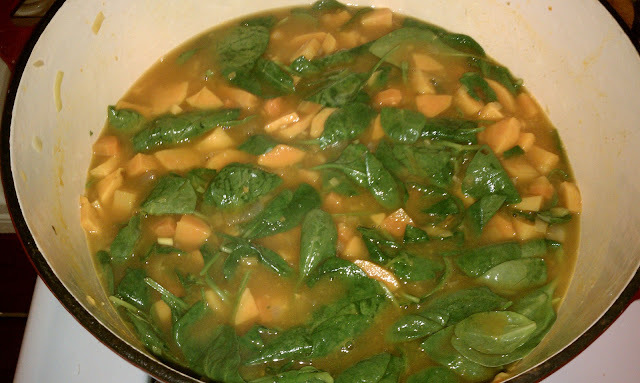 Stir in the miso paste (be sure the heat is off and the soup isn't bubbling. High heat kills all the good-for-you stuff in miso!) Ladle into bowls and garnish with green onions. 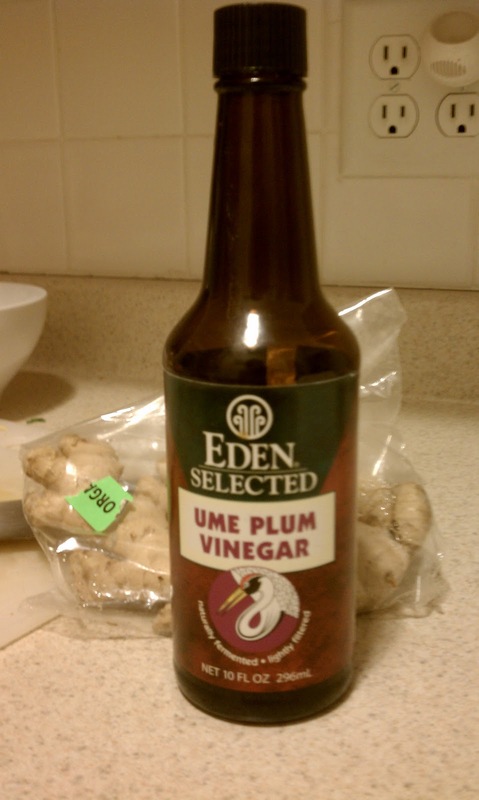 Add a dash of the ume plum vinegar if you need to kick the flavor up a notch. Enjoy! Sweet Potatoes are high in beta-carotene, vitamins A, C, and E. Their balance of protein (4 g per cup), and fiber (7 g per cup) make a filling source of sustainable energy. They even pack a little calcium and iron! They're said to fight cancer, aid digestion, prevent fatigue, and are good for the respiratory system as well.Indigenous to Central and South America, they now rank 5th as once of the world's most important food staples (after rice, wheat, corn and cassava). They can be grown in just about any climate, making them a great sustainable source of nutrition in the winter months! Oh, and they're not at all related to potatoes! Spinach is known for its iron, but as soon as you cook it, your body's ability to absorb that iron is drastically reduced, so add it to the soup at the very end to maximize it's positive properties. It's also high in vitamins A and C, provides vital amino acids, and a decent amount of calcium and potassium, not to mention chlorophyll. It's indigenous to central Asia, but is cultivated around the world in a variety of climates. It's recommended for cancer, stress, and fatigue. It does contain oxalic acid, which can iritate the digestive system, kidneys, and stomach if consumed in excess. Ginger fights inflammation and upset stomachs, promotes circulation and digestion, is great for your immune system and is known to fight cancer. Buy it fresh. It keeps for a while and you can peel and freeze what you don't use for later! Ume Plum vinegar is made from Japanese umeboshi plums. It's good for the liver, aids digestion, and is alkalinizing and antibiotic. Find it with the asian ingredients at your grocery store. Miso is a living food full of beneficial enzymes and has a rich, salty flavor. The darker it is, the longer it has been fermented and the stronger the flavor. In this recipe, I used red miso paste. You'll find good miso in the refrigerated section of the grocery store. Try your Asian market if you don't see it at your regular grocer. Powdered miso doesn't offer the same nutritional benefits! Bragg liquid aminos is a condiment that tastes like soy sauce (a little less salty with a little sweetness). It is full of aminos, the building blocks of protein! Find it in the natural food aisle of your grocery store. I love Asian flavors as well, and this sounds really tasty! Thanks for sharing this with Sunday Night Soup Night, look forward to seeing you again soon!